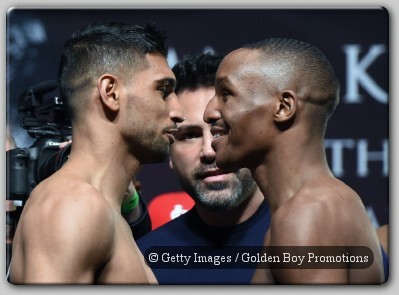 During a media conference call on Thursday Amir Khan spoke of his preparations for tonight’s fight against Devon Alexander in Las Vegas. Today I'm feeling really good. I'm feeling in great shape, not far off the weight. The weight's been good, as well. I'm really focused on this fight; not looking past this fight, just looking at Devon Alexander. I've been working with Virgil Hunter, my trainer. I'm here to beat him, sticking to that game plan in the fight, and then also been doing all kinds of conditioning work so we're going to be in full condition and in great condition for this fight. If it goes the full distance, it goes the full distance. We're going to be ready, we're going to be in front of Devon, and we're going to have the engine to go all the way through with good work and a good volume of punches. We didn't get time off for 12 weeks, 13 weeks I've been in training camp. I've got a dietician, I've got a chef cooking for me getting me the right food, which I think has made a marked improvement for how I feel when I go into the gym and train. I'm not cheating myself in any way, I'm getting in my calories at the right time. I'm feeling fresh, I have great sparring partners; I've flown guys over from all over America to come spar with me. Heavy guys and light guys and guys that move, guys that come forward, guys that come in front of me, from every different angle. We don't know what we going to be expecting. As I've been watching videos of Devon, Devon's a good fighter. He's a decent fighter going forward. We've worked on everything possible, really. We did not leave anything out. This fight was one that almost came off a year ago. Do you regret not taking it then and rolling the dice on trying to get Floyd back then? I think things happen for a reason and I think it was my first fight at the 147-pound division. It didn't happened last December because, obviously, we changed a few things and I was hoping for the big fight against Floyd and that fell through. But you need time to build into this weight division even though I got to work on what I needed to work on like my boxing skills and defence and taking my time. When you're in training camps, you're focusing on you -the fighter and how to beat an opponent. That's all, you never really work on your mistakes. stronger at this weight and I'm going to be more than ready; I'm going to be more ready than I was last year. Do you feel, in hindsight, that you were deceived by the Mayweather camp, at all? That's life. It's just one of those things. Everything happens for a reason, and it wasn't meant to be my time and I'm not going to let it get to me, but I used it in a way as an advantage, to help me and to make me work on the things I needed to and spend a lot of time in the gym. Having to do that so when I did have my first fight at 147, I was very strong and I was on top of my game. 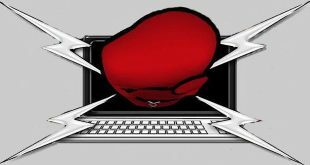 Now that you've had more time to work with Virgil, would you say that you're focusing on getting in less exchanges and looking to be a more defensive boxer, or would you say that's not true? I'm still going to be the fighter that I am. It's just in me; it's in the blood. We're just smarter. Whenever we put an attack together, there's a reason why we're putting that attack together. There has to be a way out or there has to be a way to stay out of trouble during that assault. So you can still be exciting, you can still be come forward, you can still throw a lot of punches, but being careful at the same time. That's what Virgil's brought to the table; making me a better fighter. He's making me a fighter that understands everything of what I have to do in the ring and stick to that game plan. How does Devon differ from Paul McCloskey and Zab Judah, if at all, in terms of his southpaw stance and the skills he brings to the table? Amir, can you address that, because I know you had a little bit of problems with Paul McCloskey before that fight was ended? No, I think the Paul McCloskey fight, I think we were winning that fight comfortably. I think we got to the fight, got five rounds and the head clash happened and he was cut and he didn't want to continue, but I was beating him every round before then. It was a clean win for me, really, because the head bop. Against Collazo, here again, he's another southpaw which I won every round, and I won that fight by a very wide margin. I box really well against southpaw guys. Devon is going to bring something else to the table, but I have the confidence behind me that so far every southpaw I've fought I've beaten. What does Devon bring that is new? Devon brings hand speed to the table. He brings movement, likes to be aggressive, so we're going to be ready for whatever he brings to the table, and whatever he does we're going to have answers for. He's going to come to fight, it's a massive opportunity for him. He's going to Vegas, and obviously he wants to put on a performance. Being in Vegas, I've headlined there a few times, so I know exactly what to expect, so I'm going to be nice and calm. But, it's a good time for him, and he should make the most of it. Virgil, can you address what he said about Devon and how the fight maybe with Collazo helped to prepare him for this one, or is that a completely different fighter? There are two different fights, but as long as you have the proper mind-set, you should be able to make the adjustments. Without a doubt, as Amir said, Devon brings a lot of attributes to the fight, and you have to be able to adjust to those attributes at any given time. That was the purpose of our camp, in order to try to negate whatever he brings, but there's no doubt that he brings a lot to the table. Virgil, you had said when you first got him that it's going to take a while for him to break some old habits. Did he, in fact, do all of those things against Collazo, and why do you think it took that fight? What all culminated in that fight? I think one of the main things that happened that leading up to the Collazo fight is that we had a lot of time to work together. He was anticipating another fight, so he was coming here and I was going to England, so we spent a considerable amount of time together. During those times we worked on things that we felt would enhance his ability and also make him more aware of what's going on in the ring. I would like to think that he has graduated tremendously to another level, but there are other levels to obtain. He has a high bar set. I don't think he's reached that bar yet, but you can't continue to get better until you can continue to set the bar high. So, I'm very happy and pleased where he is at this point in his career and at this point in our relationship. Of course you've been going after that Mayweather fight for a few years. How important is it for you to make an emphatic statement in beating Devon Alexander Saturday night? You know what? Why do you go to the Mayweather fight? 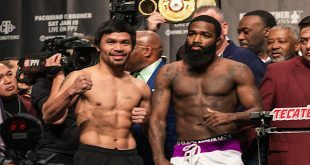 I think every fighter in the welterweight division wants that big fight against Mayweather to see how they'd do against the best fighter. 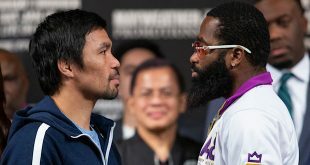 Us young fighters, and us hungry fighters, we want to fight the best and you want to beat the best and you want to see how you do against the best. You never want to leave boxing one day thinking, well, what would have happened if I fought someone like Floyd? Styles make fights and some styles cause problems to Floyd. Some styles I believe could beat him and some styles probably could be made for him. So, you have to just go with the flow, but going in to this fight, winning this fight could lead to a massive fight bill. To be honest with you, I'm not looking past this fight because I know it's a dangerous fight for me, and I made that mistake before in the past. I used to look past the fights, and fights I should have gone in and won, so I'm not that doing that anymore. And my team's taught me not to do that. Look, I'm so young, I'm 27, well, 28 today, and I'm still learning and as a young fighter I'm hungry and I just have to sometimes pace myself and just stay calm and be patient. That's the main thing, being patient, taking my time and whoever they put in front of me, deal with that person and take a step back. So, I'm not looking past this fight against Devon, because it's going to be a tough fight for me and we have to stay focused and not really make any mistakes and look good against Devon. What's it been like working with Virgil, and with that one year that you took off following the Julio Diaz fight, what's the most you've improved on? Working with Virgil is great, coming to the gym. It's not like it was in the Wild Card, or anywhere else, like training in a gym that's full and you've got people watching you and stuff. When we go to the gym it's very isolated, it's very quiet. It's a good thing because you can focus on what you need to do, and you only have people in the gym who are your gym mates and staff and the gym manager. Only having five or six people, and that's the most, that's when it's busy. So, I think that's what a fighter needs to focus. You don't need a big gym in front of people, because sometimes that can distract you being the young man you need to be. I'm such a nice person and if someone tries to speak to me I'll speak back to them, and I'll stand there while I should be training, so really we have a gym which is closed doors and I focus. What Virgil brought to the table, he made me a better fighter, he made me an understanding fighter, who understands what boxing's all about and not to make any mistakes. I'm not going back to my old self again. It's going to be in the blood where I love to fight and everyone knows that. So, with Virgil, he's made me much smarter. For this fight I must have done over 160 rounds of sparring, which helps, because the only way of putting it together and seeing where you are, seeing what you're up to is when you put it to work. I put it to work against good sparring partners and working against them and I kept my focus, kept my composure, and I know it's going to definitively help me when it comes down to Saturday, because I'm going to be more focused and I'm hungry; I really want to win this fight because this fight is a big fight for me.